I’m not sure why my father created “The Stage – Fairmont Arts & Culture Center.” It started out as a project to develop a place for parties and plays. My father purchased an old grocery store in downtown Fairmont NC and we started the construction phase with a group of friends and an electrician that’s done work for Dad over the years. We were a team of about 6 senior citizens, turning a small neighborhood grocery store into a multipurpose building. We started tearing out walls and removing old carpets in high spirits. And then we found out that there are different construction codes for businesses versus residential properties. We found out that we had to renovate based on updated fire and safety codes, compliance with the Americans for Disability Act and revised electrical and plumbing requirements. We hired a contractor, created a floor plan, submitted to building inspections, put in a lot of “sweat equity” and haggled ceaselessly about money, office space, colors and décor. My father attempted to recruit a volunteer staff – an artistic director, a sound and lighting technician, and a box office manager. A young lady from First Baptist Church agreed to become the artistic director. They agreed on a calendar of activities and we started out with casting calls for a children’s Christmas production in 2014. It was a huge success! We’re still looking for a sound and lighting director, and volunteers for ushers and box office positions. I started spending more time managing projects and programs in February 2016, and as I began to consider what could be done in the building, I felt a responsibility to ensure that there were programs and projects that lived up to the building’s new identity. Although we are known as The Stage” by our neighbors, we are also becoming “Fairmont Arts & Culture Center. As I work to stabilize the offerings at “The Stage – Fairmont Arts & Culture Center,” I’ve begun to believe that we must also have consistent business hours. I’ve instituted projects and programs that I can manage and hope that I can build a cadre of volunteers to assist in managing specific projects or programs. Most of our programs are free of charge and we are now open several hours a day, 3-4 days per week. We host “Creative Coloring” twice a month, as an opportunity for residents and visitors to explore their artistic talents. We provide a small booklet of outlines for coloring, coloring pencils and music in a comfortable environment – free of charge. Our genealogy workshop meets twice a month. We provide blank forms and information and research tools are distributed to attendees at no charge. Neighbors and friends gather once a month for “Games Night.” We offer card and board games with refreshments and at no charge. 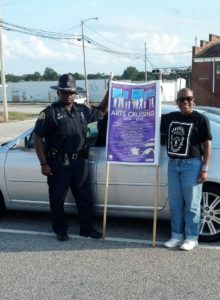 The Stage – Fairmont Arts & Culture Center also participates in partnerships with local and county organizations such as the Robeson County Public Libraries and the Robeson County Arts Council. The Small Business Center Network of Robeson Community College is offering workshops at The Stage for the development of small businesses. And there will be special events, concerts and parties from now until the end of the year! Please feel free to contact us! Check us out on Facebook! Stop by our community theatre! Please tell your friends and families about us! And if you’re looking for a volunteer opportunity in Robeson County North Carolina… we’re here!